Light and smooth, this soufflé reveals a delicate hint of truffles when savoured golden brown straight from the oven. Remove the lid and place in a preheated oven (180°) for around 15 min to obtain an individual golden brown truffle soufflé. 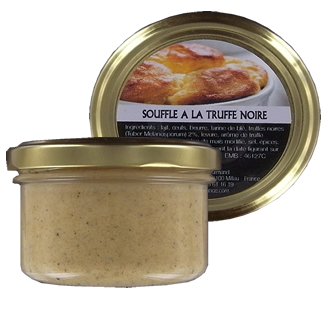 Ingredients: milk, eggs, butter, wheat flour, winter black truffle 3%, yeast, truffle aroma (sulfites, hazelnuts), modified corn starch, salt, spices.